Participating in a regular aerobic exercise program can help you guard against heart disease while also assisting your efforts to maintain or lose weight. However, you don't have to don spandex and head to a Jazzercise class to reap the benefits of aerobic exercise. Consider these examples of aerobic exercise and how they can meet your health and fitness goals. Before you hit the treadmill or join a spin class, you want to make sure that the program you choose is one that you'll stick with. If you're a highly social person, you may want to select a group exercise class or commit to a walking program with friends. 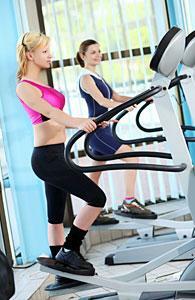 If you have joint problems, you may want to consider non-weight bearing exercises like swimming or cycling. Pick something that will keep you engaged and challenged. You may even want to switch up your routine regularly to help prevent boredom. Just remember - the most effective aerobic exercise program is the one that you'll stick with. Low-impact forms of aerobic exercise allow you to keep at least one foot in contact with the ground at all times. This type of exercise reduces jarring or pounding on the bones and joints. Low-impact exercises are particularly beneficial for people with bone and joint problems or individuals just starting a workout program. While overweight and obese individuals are certainly not limited to performing low impact aerobics, sometimes these forms of exercise are more comfortable, especially at the onset of a workout program. Consider the following examples of low-impact aerobic exercises and their estimated one-hour calorie burn for a 150 pound woman. Exercise performed in a body of water significantly reduces the impact on bones, joints and muscles. Don't assume that this means the exercise will be easy, though. An hour of moderate-intensity freestyle will burn approximately 476 calories, while vigorous swimming will burn roughly 680 calories per hour. If you love walking or jogging, but you've been laid up with an injury, try taking your program to the pool! An hour of water jogging will burn approximately 500 to 600 calories, while an hour of water walking will burn between 300 and 500, depending on your intensity level. The key is to move your arms and legs at roughly the same speed you would be moving them on land. You'll discover that the resistance provided by the water will increase your heart rate significantly, despite the lower-impact form of these exercises. There are lots of different styles of water aerobics, from deep-water to shallow-water and high-intensity to low-intensity, so you can expect to see a wide variation in calories burned between classes. For a traditional, moderate-intensity water aerobics class, a 150-lb woman can expect to burn roughly 272 calories over the course of an hour. The number of calories you burn during cycling will vary based on your speed, terrain and intensity level. A moderate-intensity bike ride will burn approximately 476 calories in an hour. If you really push yourself, you could burn as much as 850 calories. Rollerblading is a fun and low-impact form of exercise that blasts calories fast. Just keep in mind that rollerblading also requires a relatively high level of balance and coordination, so you may want to work up to this type of routine if you're just starting an exercise program. An hour of rollerblading can burn anywhere from 336 calories per hour for a leisurely pace to more than 1,000 calories per hour at a very vigorous pace. The elliptical machine was basically invented as a low-impact running machine. The sliding motion of the elliptical foot pads allow you to "run" without jarring your ankles, knees and hips. Calorie burn will be slightly lower than if you were actually running, but you can increase your intensity accordingly to burn more calories. 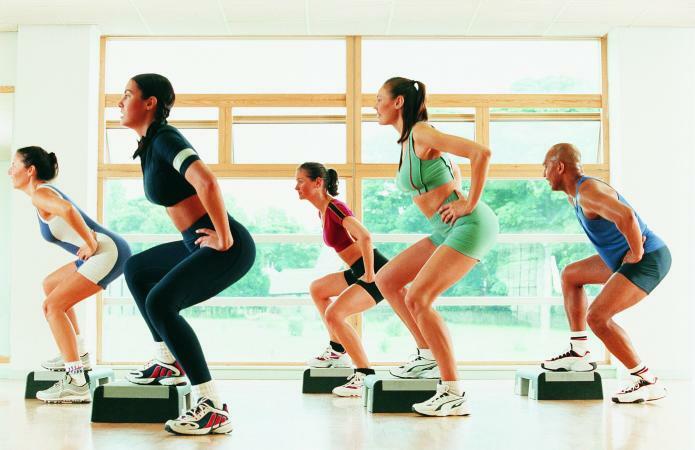 Expect to burn about 475 calories per hour when working at a moderate intensity. Want an easy workout that works? Try walking. An hour of moderate-intensity walking will burn between 250 and 300 calories an hour. Bonus? All it requires is a sturdy pair of shoes. If you like the idea of walking but want to burn more calories, consider hiking on rolling terrain or while carrying a pack. An hour of cross-country hiking without carrying extra equipment will burn about 400 calories an hour. Any group aerobics class that doesn't involve jumping, running, leaping or vigorous punching or kicking is generally considered a low-impact class. These may include classes like Zumba, beginner step classes and other dance classes. Calorie burn will vary by class, but you can expect to burn roughly 340 calories per hour. As long as you aren't running up the stairs, stair climbing is a high-intensity but low-impact form of aerobic exercise. An hour of stair climbing will burn about 611 calories. Cross-country skiing is a workout that requires the engagement of both the upper and lower body. An hour of moderate-intensity cross-country skiing will burn about 544 calories, while vigorous intensity skiing will burn 612. Whether you're rowing on a rowing machine or in a canoe, kayak or other water craft, you'll quickly feel your muscles start to burn as you pull against the resistance. An hour of moderate rowing burns about 476 calories. Just because you have a lower body injury that's preventing you from your regular workout routine doesn't mean you can't still do an aerobic workout. Most gyms offer arm ergometers, or arm cycles, for an effective upper-body workout that will also get your heart pumping. An hour of arm cycling will burn about 200 calories. Circuit training is a form of strength training that moves you quickly from one exercise to another so that your heart rate remains elevated. As long as you aren't performing plyometic exercises or cardio bursts that involve running or jumping, circuit training can be considered low-impact. An hour of circuit training will burn roughly 544 calories. High impact exercises are those where both feet are periodically off the ground at the same time. These tend to be high-intensity forms of exercise that can be more stressful to the bones and joints. This isn't necessarily a bad thing, though. If you don't have injuries that could prevent you from performing this type of exercise, you may actually be able to burn calories at a higher rate while also challenging your cardiovascular system. This can result in a leaner, fitter physique, faster. Hit the pavement for a jog or run and burn between 600 and 800 calories an hour, depending on how fast you're pushing yourself. Burn even more by running hills or incorporating intervals. Jumping rope is a tough form of aerobic exercise that will challenge everything from your calves to your shoulders, as well as your heart. An hour of jumping rope will burn about 660 calories, but don't feel bad if you can't make it the whole hour! When you play basketball without a significant number of timeouts or breaks, it can be considered an aerobic workout. Playing steadily for an hour will burn about 544 calories. 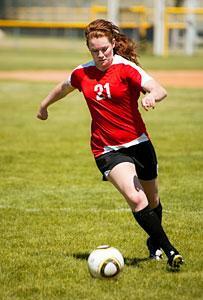 Soccer is another sport that can be aerobic or anaerobic, depending on how it's played. If you keep the game going without many breaks, an hour of play will burn 476 or more calories. As long as you and your partner keep the volley going, tennis can offer an effective and fun means of aerobic exercise. Expect to burn about 544 calories in an hour. When you join an aerobics class that involves jumping, running or leaping, you've officially graduated to high-impact aerobics. Most classes will burn about 476 calories in an hour. If you've ever watched popular dancing shows like So You Think You Can Dance? or Dancing With the Stars, you know that there's lots of running, jumping and leaping involved. Dance classes that incorporate this type of movement are considered high-impact dance. Expect to burn between 300 and 600 calories an hour depending on the amount of high-impact activity involved. High-impact moves don't just have to involve contact with the ground. Kicking, punching and blocking exercises can all be high-impact as well. A 60-minute kickboxing class will burn about 680 calories. There's circuit training, and then there's high-intensity circuit training. This type of exercise incorporates bursts of high-intensity cardio or high-impact plyometrics into the circuit workout. Not only will this bump up the intensity, but it will also bump up the calorie burn to more than 600 an hour. Almost any form of aerobic workout can get you the results you want, but you need to understand that how hard you push yourself will play a significant role in the number of calories you burn and the muscle you build. Pushing yourself to go faster or work harder won't always be comfortable, but it will help you achieve your goals. Try to work at an intensity that requires you to increase your breath rate while breaking a sweat. Examples of Aerobic Exercise By Laura Williams, M.S.Ed.